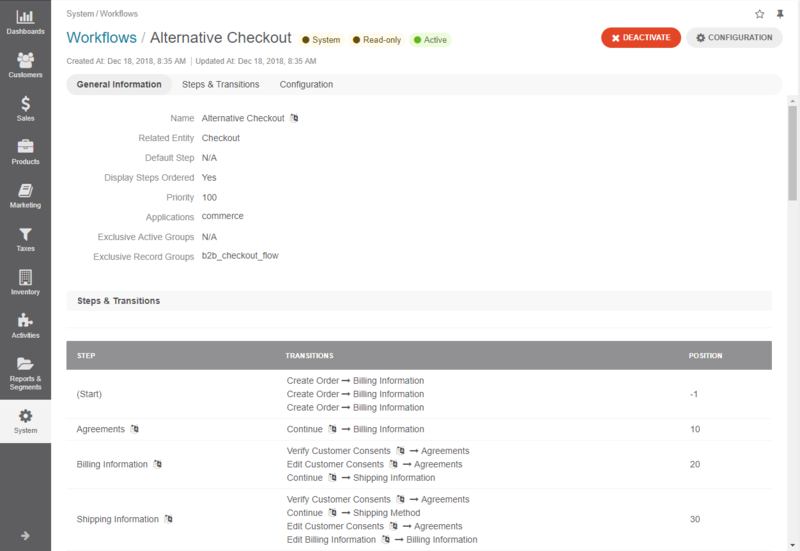 The Alternative Checkout workflow represents an example of the checkout workflow customization. It is a system workflow that defines the sequence of steps and transitions that a user can go through when creating an order in the storefront. 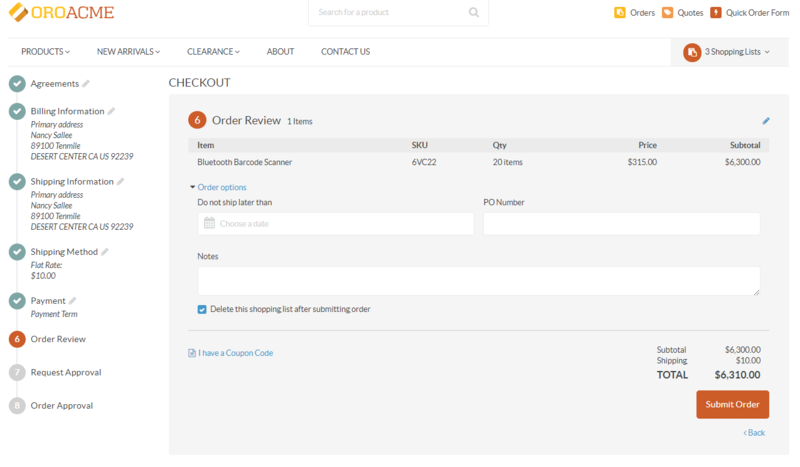 In addition to the standard checkout steps, alternative checkout workflow includes request and order approval steps before creating an order. For this workflow, orders with subtotals exceeding the specified value will have to be reviewed and approved by users with the permission to approve orders that exceed the allowable amount. By default, the order approval threshold is set to 5000. 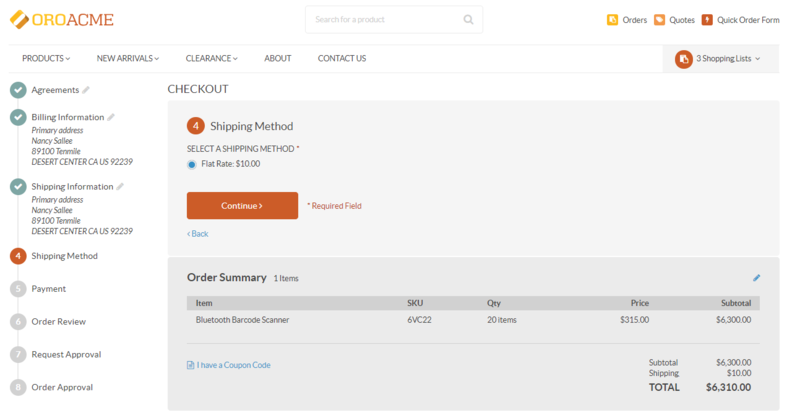 Please keep in mind that the default alternative checkout is merely an example of an alternative checkout workflow. 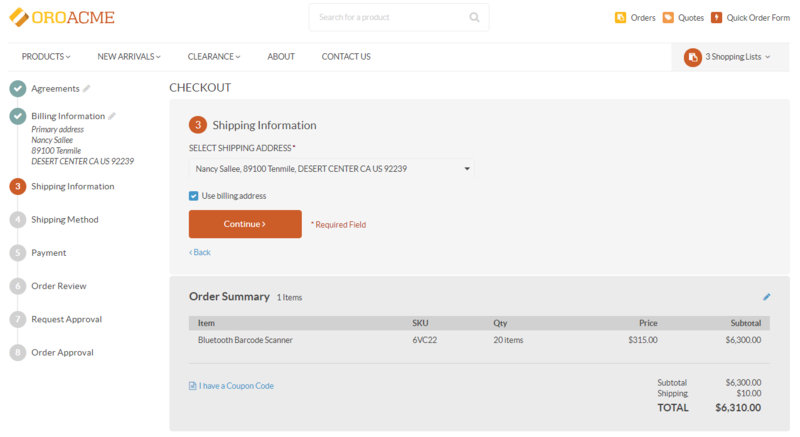 Enabling it for your customer users in the OroCommerce storefront requires some customization efforts. 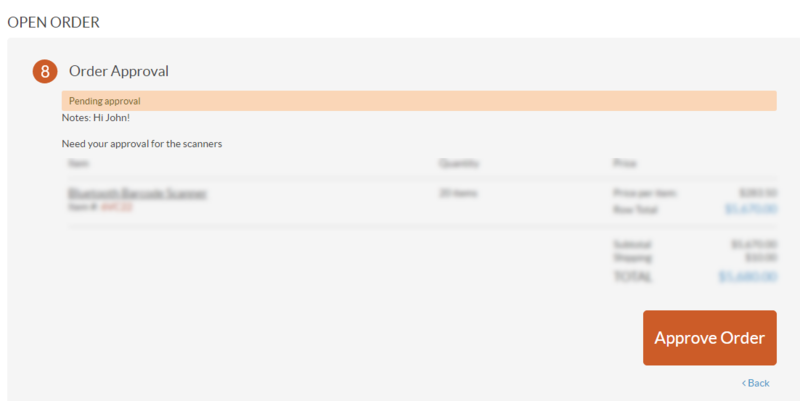 Navigate to System > Workflows in the main menu. 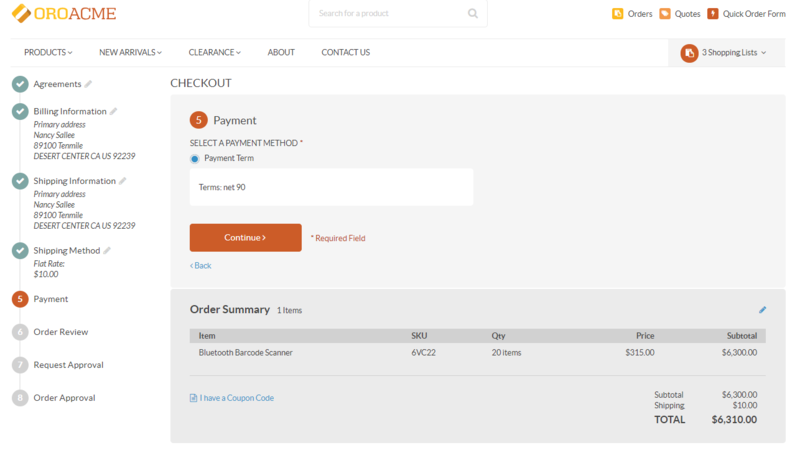 Click Alternative Checkout to open the flow. Configure order approval threshold: Configuration. Deactivate the workflow – click Deactivate to deactivate the workflow. 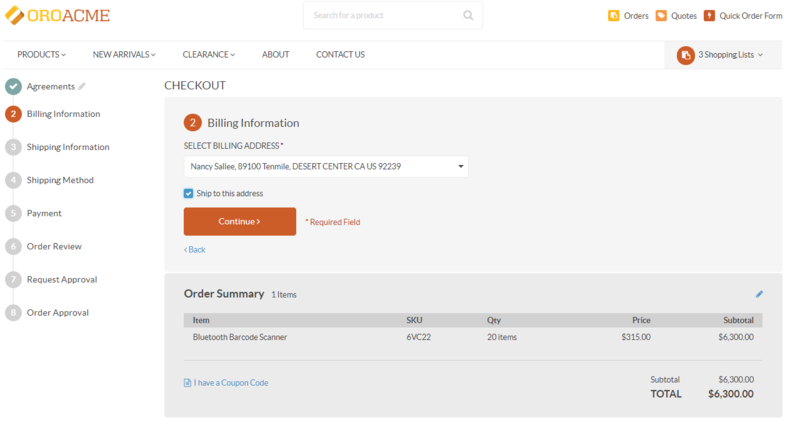 As an illustration, we are going to proceed through the steps of the Alternative Checkout workflow in the default OroCommerce storefront. Several items have been added to a shopping list in the OroCommerce storefront. To proceed to the checkout, click Create Order on the bottom right of the shopping list page. A warning message is shown if for some reason you are unable to start the checkout process. At the Agreements step, you are required to accept all mandatory consents to process your personal data, if such consents have not been accepted previously. Keep in mind that if you leave the checkout after accepting a mandatory consent, this consent is considered accepted and can be revoked only through the profile management. Once the consent is accepted, click Continue to proceed through the checkout. The checkout is now open. The next step is to enter billing information for the order by selecting an existing address from the address book, or creating a new one. Checking Ship to this address allows you to use the provided billing address as shipping. Clicking Continue redirects you to the next step. 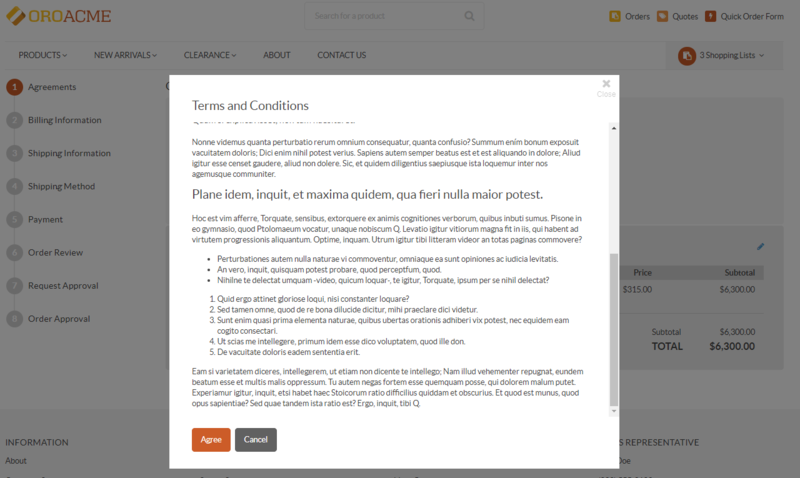 You can edit the already provided information (until the order is submitted) by clicking on the left side of the page. If the Ship to this address box has been checked at the Billing Information step, the provided address is automatically selected at the Shipping Information step. To edit shipping information, clear the Use billing address box and provide a different shipping address for the order. Provide a shipping method by selecting one from the list of the available methods. Choose a suitable payment method by selecting it from the list of all available methods. To submit the order, click Submit Order at the bottom of the page. Since the order amount exceeds the threshold of $5000, manager approval is required to submit the order. Order Approval will remain pending until the manager approves it. The manager can approve the order by navigating to Orders, selecting the required order and clicking Approve Order. Once submitted, the order will be received and dealt with by the sales team.